Using the same auditory, frequency, and mastery approach as The Phonetic Zoo, these nine different sets of MP3 spelling and vocabulary lessons by Andrew Pudewa, Dr. James B. Webster, and Maria Gerber will help prepare your student for a wide range of studies. This program is intended for self-directed study, with students independently learning and testing their knowledge. The student begins by listening to the MP3s, which gives him a spelling test. The words are presented and used in a sentence. After the student spells all the words, the correct spelling is given on the MP3 along with the definition of the word. The student takes the same test everyday until he obtains 100% twice in a row before moving onto the next test. 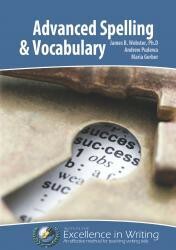 Thus, the student can practice spelling and hearing the definition of the words until he achieves mastery. Each module has 4 lessons with 24 words per lesson. This course comes on two CD-ROMs containing all nine modules and a PDF booklet containing full instructions and the list of words and definitions.